Everywhere I look these days, I seem to find another feminine person rocking a buzzcut, including celebrity women with shaved heads — and I love it. Inspired by the media and my close friends' sartorial choices, I got a buzzcut myself this summer. For me, shaving my head was about body positivity and feeling more comfortable in my gender identity. But, of course, it can mean something different to everyone. Some folks I know shaved their head to stay cool and hassle-free during the hot summer months. Others needed a big sartorial change in order to feel in control of their lives and centered in their bodies. But overall, most just found it empowering. By immersing myself in they trend, I began realizing just how new it is for women and feminine people to opt for shorter locks and buzzcuts as often as they currently are. With hairstyles being so uncomfortably tied to gender, it's often considered shocking or subversive when a woman shaves her head (since, after all, feminine folks are expected to maintain long and flowing locks). But thanks, in part, to certain bald-headed celebrities over the years, buzzcuts on feminine people have gotten a measure of visibility. And though the use of the trend is usually accompanied with a level of outspokenness and general badassery, these folks exemplify the simple notion that the buzzcut is a worthwhile option for all people. Let these 11 bald-headed ladies prove to you that feminine buzzcuts can be totally empowering. Perhaps my favorite example of a badass woman with a buzzcut over the past couple of years has been Charlize Theron as Furiosa in Mad Max: Fury Road. Theron's character exuded strength and resilience, inspiring many people I know to channel her fierce energy through their short haircuts. 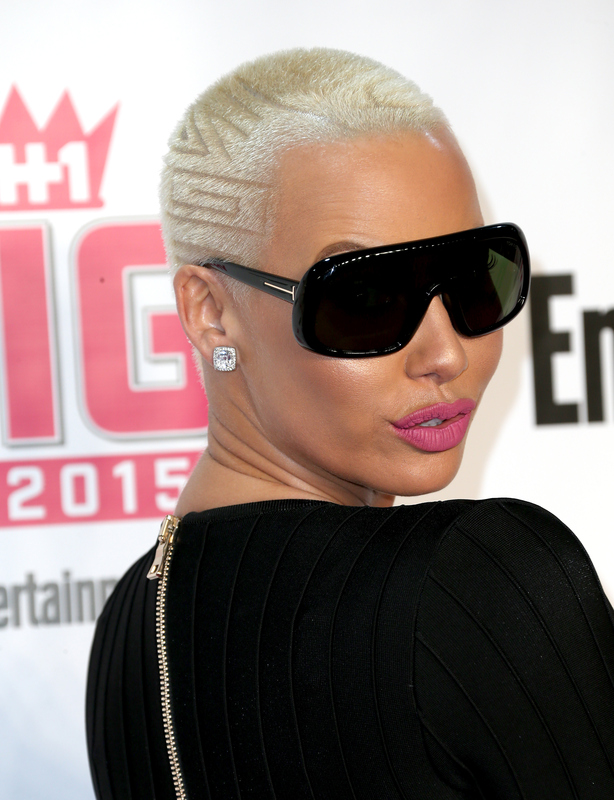 Feminist queen Amber Rose has been rocking the buzzcut for about as long as she's been in the public eye. And as a highly feminine model, Rose exemplifies the fact that short hair does not have to contradict femininity. A few years back, musician and mega fashionista Solange Knowles rocked a buzzcut on the red carpet. She looked amazing with the 'do, which likely surprised no one since she normally rocks a vast array of hairstyles with ease and confidence. The best part of the 1997 film G.I. Jane? Obviously the head-shaving scene. Demi Moore showed us that you don't have to be a guy to be in the Army... and that many women are not as attached to their long locks as we might believe. Despite the darker vibe of the film, Natalie Portman looked angelic in the buzzcut she rocked in V For Vendetta. Sure, the head-shaving scene was quite emotional. But honestly, her coolness was and remains undeniable. In 2015, Lupita Nyong'o rocked the hell out of a buzzcut, bringing vibes of Old Hollywood glamour back to a haircut that is often perceived as less formal and feminine. As a supermodel legend and the queen of androgyny, Grace Jones has been repping the buzzed look, seemingly as a form of gender subversion, for her entire career. Though Doctor Who star Karen Gillan looks gorgeous in her long, red locks, I treasured her buzzcut phase the most. Her cut still makes it clear that you definitely don't have to choose between cute and edgy aesthetics when it comes to the buzzcut: A shaved head is just as cute as any style. The Walking Dead and Eclipsed star looks dazzling in her buzzcut, the hairstyle only allowing more room for her ethereal glow to shine. My favorite buzzcut in the media lately has been that of Millie Bobby Brown as Eleven in the Netflix Original series Stranger Things. Since androgynous-looking kids don't usually get tons of media representation, I was thrilled to see that the powerful female protagonist of the series rocked a buzzcut just like me. Thanks to celebrities like Rose, Nyong'o, Brown, and many others, we can hopefully garner a broader sense of how many aesthetics perceived as "androgynous" or "less desirable" have the potential to be so much more than a stereotype.